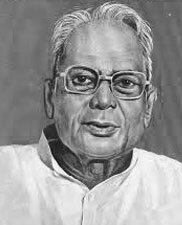 Jay Prakash Narayan( 1902-1979 ) was born in Sitabdiara a village in Ballia of Uttar Pradesh, where Ganga and Sarayu meet. He did his High school from Sisabdiara and thereafter was sent to Patna to do his college and with the blessings of Gandhi he was married in Patna, but his wife was sent to Sarbarmati Asharam. While JP did his studies and went to USA for further studies where he did odd jobs in order to pay for his education.In 1929 he returned to India and joined the Congress Party. In 1932 he was sentenced to a year's imprisonment for his participation in the civil-disobedience movement against British rule in India, thereafter he formed Congress Socialist Party, a left-wing group within the Indian National Congress. J P was imprisoned by the British again in 1939 for his opposition to Indian participation in World War II on the side of Britain, but escaped and for a short time tried to organize violent resistance to the government before his recapture in 1943. After his release in 1946 he tried to persuade the Congress leaders to adopt a more militant policy against British rule. In 1948 he, together with most of the Congress Socialists, left the Congress Party and formed the Praja Socialist Party in 1952. Soon fed up with the political atmosphere he announced in 1954 that he would now concentrate and devote his life exclusively to the Bhoodan Yajna movement founded by Vinoba Bhave. In 1959 he floated a new agenda for a "reconstruction of Indian polity" by means of a four-tier hierarchy of village, district, state, and union councils. In 1974 Narayan came back to politics when he saw the rise of corruption in India and the increasingly undemocratic government of Prime Minister Indira Gandhi. He gained a following from students and opposition politicians and from the masses. Narayan was one of the people who wanted Mrs Gandhi to resign, and therefore in Emergency he was put in Jail. In prison his health broke down. He was released after five months but never regained his health. When Gandhi and her party were defeated in elections in 1977, Narayan became the advisor of the Janata party in its choice of leaders to head the new administration. He too died a broken man dreaming to build India where there was true freedom to all.